Quite pleased with the look of this and a nice supercharger sound from it. Fitted it to replace a red Forge silicone intake hose as I'd read the Forge are prone to collapsing. Rerouted the left side fuel hose beneath the intake hose to clean up the look. Also fitted an ECS air scoop to the front of the OEM air box. Looks nice. How loud did the supercharger get? The dramatic change was in going from the resonated stock intake to the Forge silicone. Changing from silicone to carbon fibre gives a bit more. I guess the rigid construction conducts the sound more. Sounds way better than stock. This is definitely going to be my next purchase. Have you done a stage one download? Car has Revo Stage 1 ECU and TCU remap. How much was this filter option and where from? What bit do you mean? The ITG foam filter or the ECS carbon fibre intake? I did assume that the ITG came with it. I have an eventuri ready to go on, but it was seriously expensive and am considering selling it to free up some money for something cheaper that does the same thing. Just to clarify. The air filter box is stock. I got the ITG foam reusable filter first. I think a lot of people go for K&N reusable filters. I then replaced the factory intake hose (between the air box and engine) with a Forge red silicone hose (2nd hand eBay, £40). These are apparently prone to collapsing under load and the preferred brand of silicone hose seems to be 034 Motorsport (I think this is what MRC use). I decided that wanted to swap out my Forge silicone for rigid carbon fibre. The only one I could find without spending shedloads on additional CF bits such as covers and airbox etc (e.g. Carbonio, Eventuri, Revo and APR) was the ECS. You can get it from AwesomeGTI for £168. I also fitted an ECS intake scoop to the front of the factory airbox but this would prevent the fitting of an aftermarket cooler. 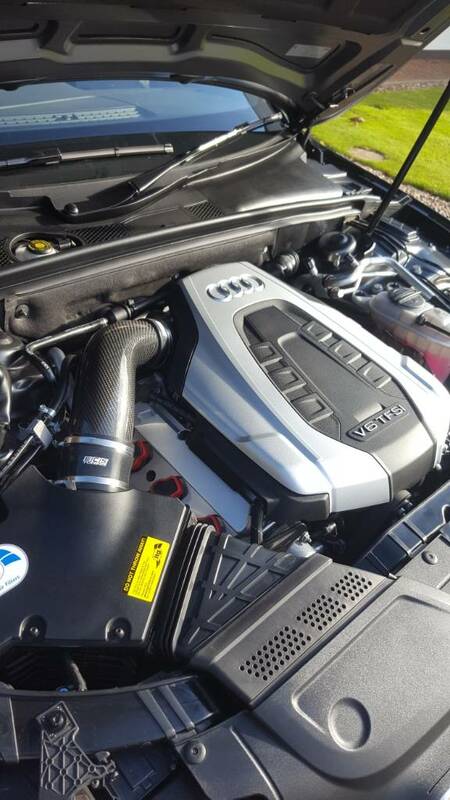 Ive just purchased the same intake how easy is it to fit? Any pics of the ECS air scoop? I'm thinking of doing this, but it doesn't fit with the APR CPS (which I may get at some point). 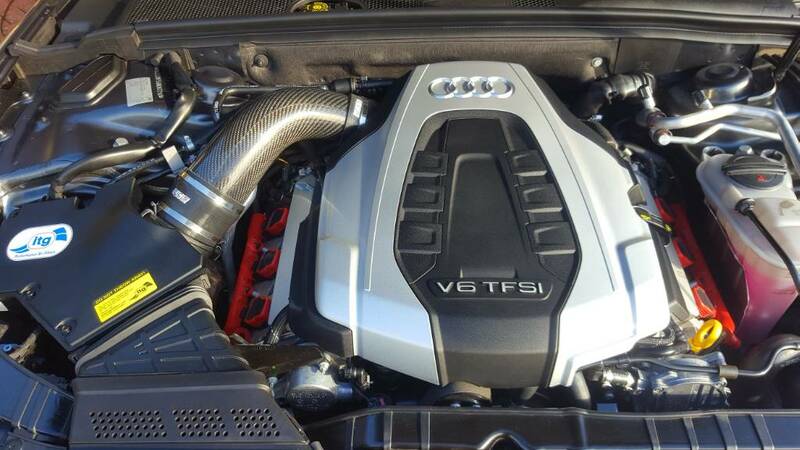 [QUOTE=HTB;1579616]Quite pleased with the look of this and a nice supercharger sound from it. Fitted it to replace a red Forge silicone intake hose as I'd read the Forge are prone to collapsing. That looks way better than stock item and for the price is a no brainer imho. Just updated my intake system and will be ordering the front scoop anytime soon. How difficult was it to fit the intake? And what does the carbon pipe clamp to the air box doesn’t have a lip on it does it?? The intake is dead easy to fit. You simply pop out the 4 plastic pop up clips above your grill,then pull the plastic slam panel up. Once this is removed you will see 2 torx bolts which hold the original intake scoop in place. Disconnect the scoop from the air box snorkel and replace with ecs unit.put torx screws back in an replace upper panel. Regarding the intake pipe I imagine the carbon pipe clamps to the 2 silicone hoses. The smaller pipe clamps to the throttle body 'the bigger hose clamps to the air filter coupler. Last edited by Redline_dtm1; 19th April 2019 at 10:29 PM. The intake is dead easy to fit. You simply pop out the 4 plastic pop up clips above your grill,then pull the plastic slam up. Plastic front panel clip par number is 4D0807300 . Should be able to get them from TPS or main stealer.